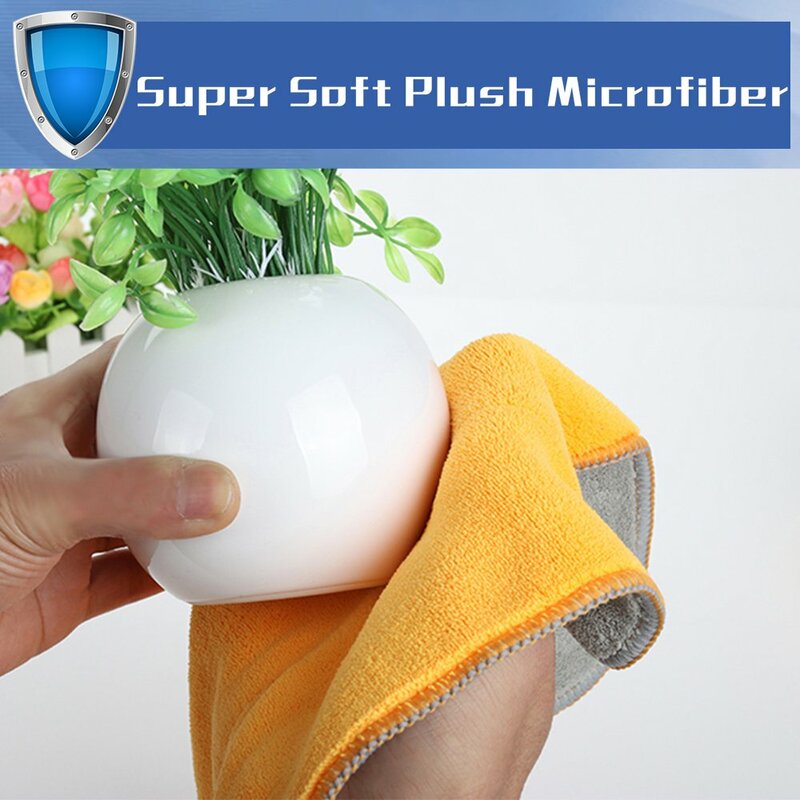 【SOFT & LINT FREE】With both pickup power of microfiber and softness of velour, these super plush microfiber will not scratch paints, coats or other surfaces. 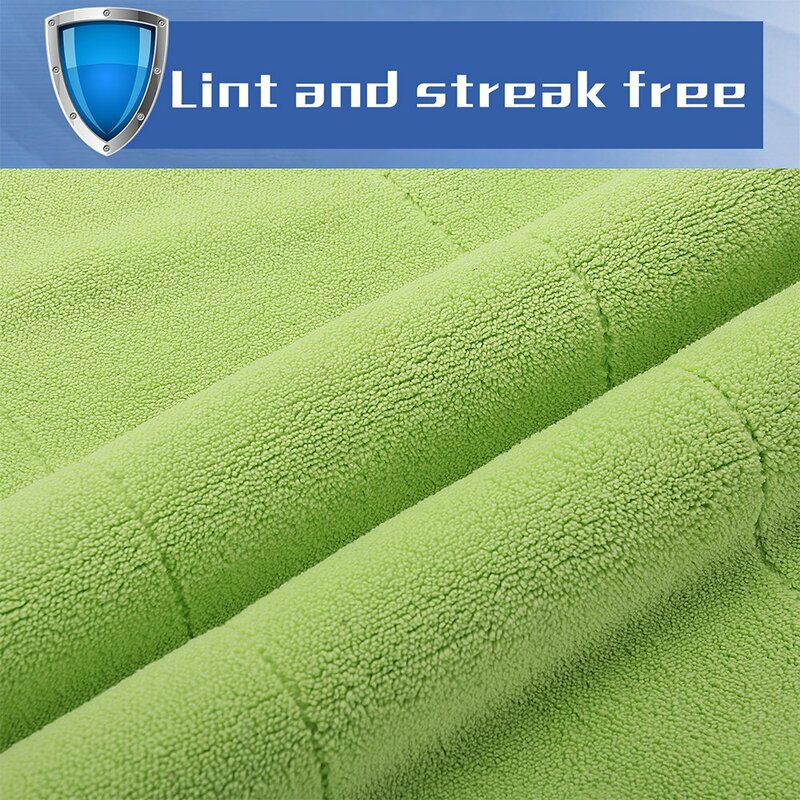 No Streaks and Lint Free! Great for cleaning cars, RV's as well as in your home on TV's, computers, counter tops, and more. 【3 BRIGHT COLORS】Comes in 3 colors enable you to color code for different cleaning tasks. Red x 2, Green x 2, Orange x 2. Standard size: 12 x 16”. 【DURABLE】Rinse and reuse 500's of times. 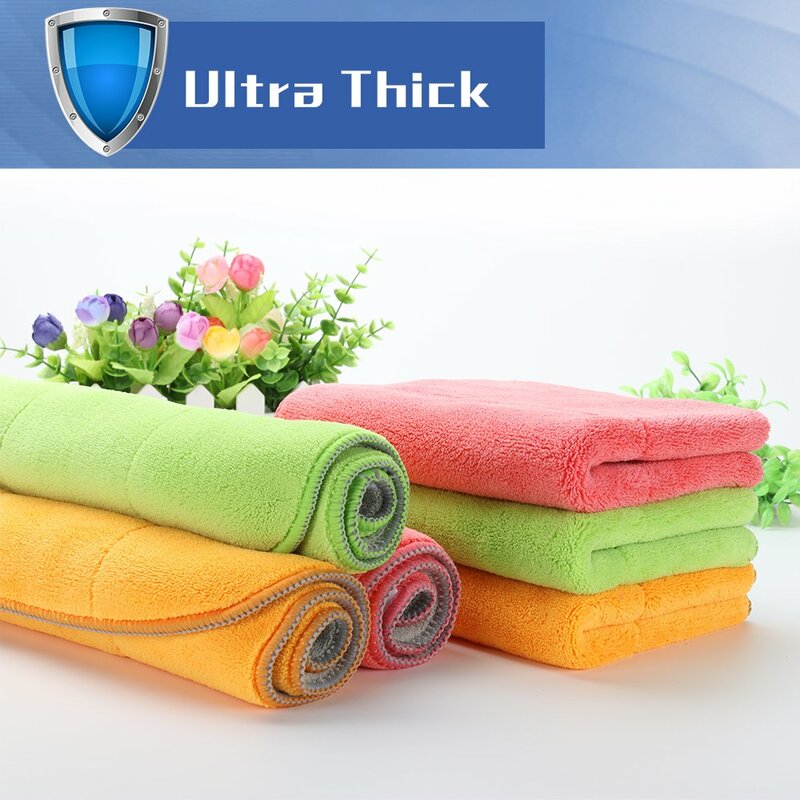 For best washing results, only wash cleaning cloths with other microfiber materials in cold water and let them air-dry. 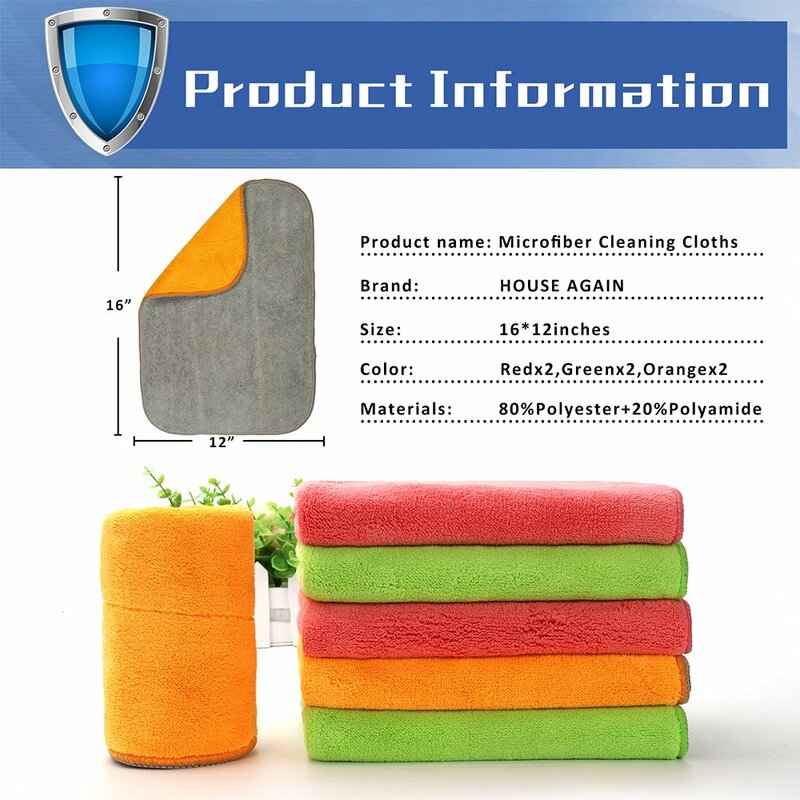 I have been using microfiber cleaning cloths for ages. I am not a regular poster here, but I thought this company deserves a plug, as these are the best microfiber cloths I have ever come across. Upon receiving them, I was blown away by how soft and cushy they are, how thick and luxurious (each cloth is 2-ply), and by the amount of dirt and water that they can hold. I became inspired and walked around the house cleaning dust out of crevices and off baseboards. I cleaned my glasses and took the fingerprints off all my stainless. Then I cleaned my entire car with just one cloth and water u2013 one side for the inside, and the other for the outside. I am immediately ordering another set. These cloths are wonderful. They are thick, soft, large and super absorbent. I clean for a living and this cloth does it all. It works great in tubs and showers. It cleans as good as my pricier Norwex cloths. They really grab soap scum, hair etc...and leaves surface shiny streak free and nearly dry. No need to go back over with (dry) finishing cloth, which saves me a lot of time and work. If I had to say anything negative, it would be that the cloth is so thick and large (larger than a wash cloth but smaller than a dish towel) that it is a little more difficult to wring out if you have weak or painful hands. All in all, these cloths are great for the price ! Excellent! These are great for drying dishes, dusting, mopping floors cleaning windows, drying my hair after a shower, etc. I am able to write on the tag what each towel is for in a pen so I can keep it separate for each use. The different colors make it easy to remember and ide tify their uses as well. My only issue is there are so many uses, I wish there were more colors! Keep one in the car, bathroom, kitchen, laundry room, etc. Great uses. I ordered a set of these and loved them so much that I decided to order another set. On the second set, two of my towels had slight defects, but I contacted the company and they graciously and quickly send out a new set of towels! 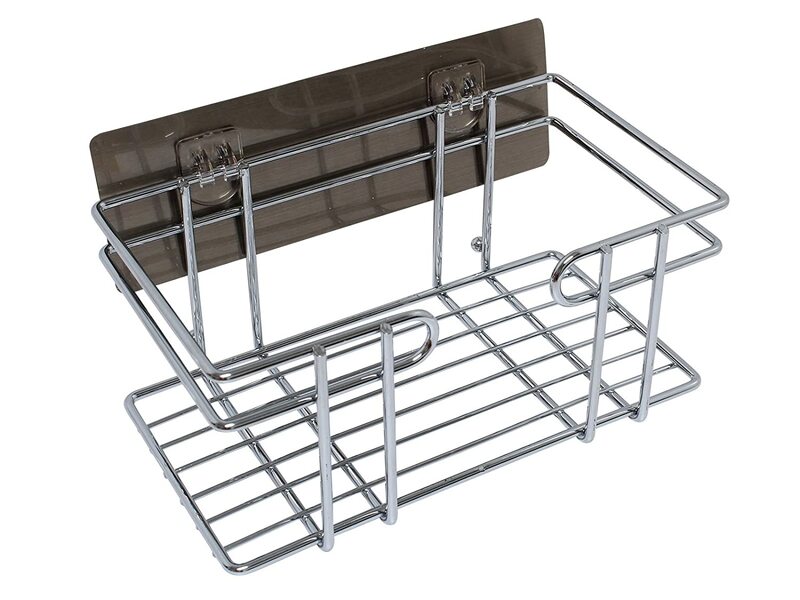 So I know have 3 sets and think this is an adequate amount for my home so a towel in each area can always be in the hamper. 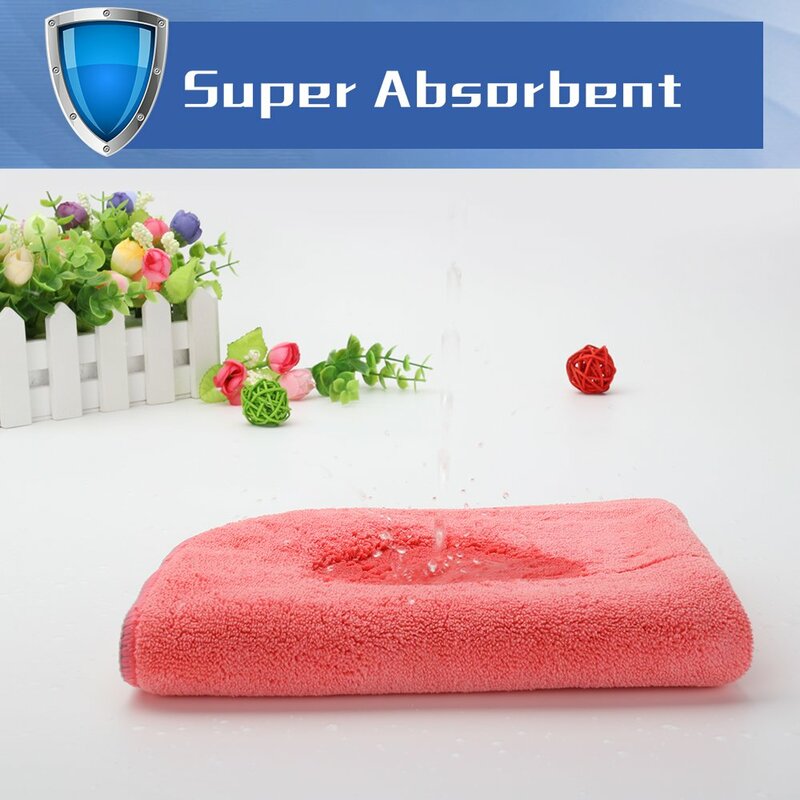 Very absorbant! I wash them with my normal clothes (no towels) and I have had no issue with lint at all! These are literally the best microfiber cloths. Very thick, plush, and wash amazingly! I recommend these for every use you can think of. 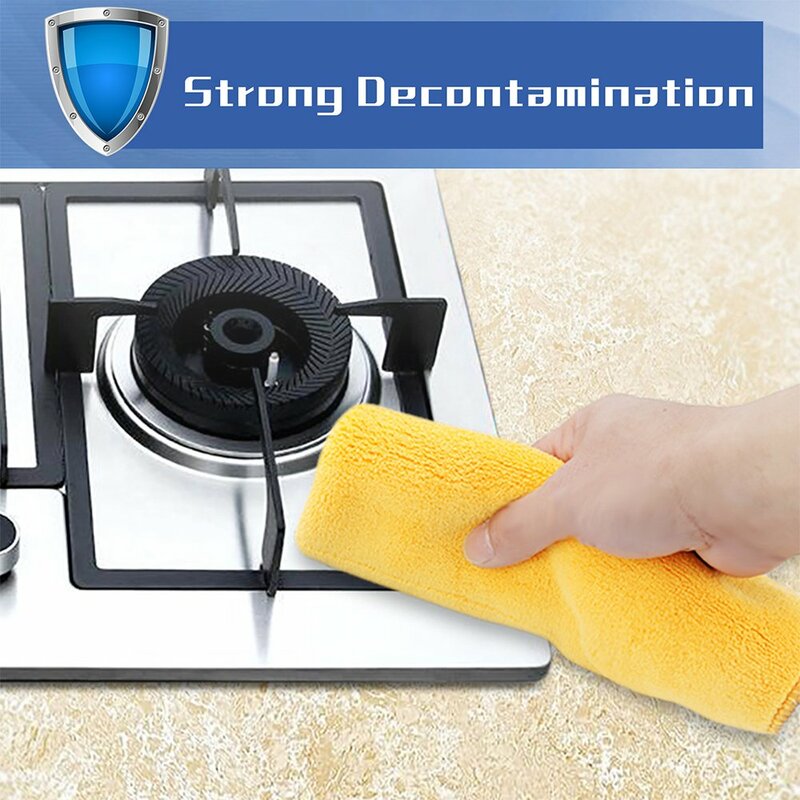 They leave an incredible streak free finish when cleaning glass with them. Love! Love! Love! These are some really nice microfiber towels. I was really surprised at the quality (considering the price). Just the right size for me. Thick and soft and does a really good job of absorbing liquids completely and leaving a clean surface behind. I washed mine and removed the tags before using. I'm hoping I can break my paper towel habit and start using these. These are a good investment and cheap enough to replace once they become unusable. These are fantastic! For the price, it was much thicker than I expected. Itu2019s super absorbent and a lot of times I donu2019t even have to use any kind of cleaner to wipe smudges off. Itu2019s perfect for anything you want to clean. I definitely am happy I bought this item!